fuboTV is a live streaming TV service. This service is for you if you want all of the sports you can desire. The only drawback is ESPN is missing. fuboTV has recently increased their channel counts. You can purchase several add-on packages including Latino and Portuguese languages. Price is a little high but the service includes several channels that would likely be add-ons for other services giving it a fairly solid value. fuboTV is an online streaming video service. fuboTV is a no-contract live TV streaming service that delivers live television through your internet connection to devices such as computers, tablets, smartphones, or streaming devices. It requires no installation, there are no extra fees, and you can cancel anytime. The price is comparable to other services and is significantly cheaper than cable or satellite TV. fuboTV is one of the top choices for cord cutters looking for the most access to sports programming. It is important to note that fuboTV does not carry ESPN or ABC. In addition to getting access to virtually every major sport and league at the college, national, and international level you also get access to over 87+ channels such as FX, SyFy, A&E, and HGTV. Another feature that stands out is the DVR capacity and functionality. 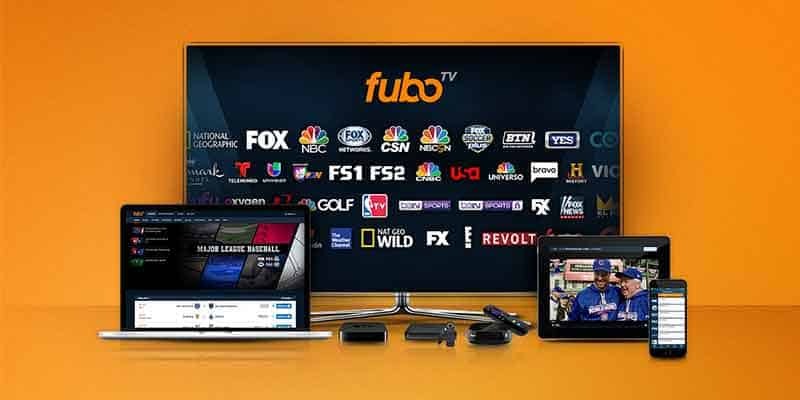 fuboTV offers subscribers the fubo and fubo Extra streaming plans. The fubo plan offers access to 87+ channels, direct access to all beIN CONNECT channels, and regional sports at no extra cost. The fubo Extra plan also offers these things but increases to 103+ channels and includes 30 hours of Cloud DVR. They also offer the fubo Latino and fubo Português plans. The fubo plan is offered for 1 month at $34.99 per month but is $44.99 per month after. The fubo Extra plan is $39.99 for the first month and $49.99 per month after. fuboTV is supported by a wide array of devices leaving subscribers with many options. Users have the flexibility to watch their favorite shows and movies in a variety of different ways such as at home on your television or on your phone while you’re on the go. Here is a list of compatible devices. Subscribers to this service can stream on two devices at the same time. fuboTV offers the ability to stream on a third screen but for an additional $5.99/month. fuboTV has one of the best DVR capabilities out of any streaming service. 30 hours of storage are included with the base Premiere. For an additional $9.99/month users have the option to get the Advanced DVR which includes 500 hours of storage. This DVR allows you to record in real-time or retroactively. The limit for simultaneous recording is two. fuboTV includes “TV Anywhere” which allows you to login into over 25+ logins for various channel apps (including NBC, Fox, Bravo, E!, Fox Sports, & NBC Sports). Users also get Lookback, which allows you to watch sports and entertainment shows that have aired within the last 72 hours that are not on demand. You also get access to Fox Soccer Plus. There are no parental controls. Like most streaming services there are local channel restrictions depending on your market. Generally, you should have access to CBS, FOX, NBC, Telemundo, The CW, and Univision. FOX may not be available while traveling outside of your home market. Noticeably absent is ABC. This calculator is designed to demonstrate what your typical cost savings would be if you canceled your cable subscription and signed up for one of fuboTV’s streaming plans. First, enter the cost of your current plan and then choose which plan you would like. Click here to see our 2018 Cord Cutting Calculator that includes all services.